Here in “What is Geothermal Energy” I give you an introduction into this important extension to Solar Power – Important esp. because of the coming Global Cooling. Why and What is Geothermal Energy at all? You probably already heard in school about the theory how earth was created? Our Solar System was created billions of years ago from one giant ball of super hot gases (plasma), a residue of the so called Big Bang which again happened another billions of years earlier. This hot plasma ball, created during this unimaginable, still scientifically debated and theoretical (for the moment of this Big Bang physicists conveniently say the laws of physics were not in rule) cosmic event, drifted through time and space. From this gas balloon, over time smaller parts of gas bubbles broke off and started to form little gas balls circling around the original ball at the center, which then later became our sun. Over time these “spin-off” gas balls cooled down more and more, gas became liquid and later partly solid – the planets of our solar system. So forming the planets of our solar system. At her core the earth is still red-hot and liquid. As a matter of fact, this also explains why our continents drift, with Europe and America for example parting some centimeters every year. The continents we know today and believe to be absolutely solid are nothing else than plates of now “frozen” gas swimming on an “ocean” of still red-hot, liquid matter. Earth’s core. Please let me proudly state here that the discovery of this continental plates’ drift was first made and described by one of my relatives, Alfred Wegener (*1. November 1880 in Berlin, died November 1930 in Greenland). He also originated the idea of “Pangäa”, the idea that once there was only one continent, which over time split up into what we see today. But back to how and why Geothermal Energy came about: This original heat from the time when our solar system was formed is still there. Also do radioactive processes within the earth still create new heat. And also the sun partly re-heats the earth’s crust. 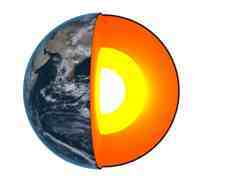 All in all, the earth today has an amount of heat energy of 1031 joules (J). This energy is slowly but constantly radiated into space: The earth continues to cool down. So the question arises whether it is safe to extract and use Geothermal Energy. I mean, wouldn’t we speed up the cooling down process by that, turning Earth into an uninhabitable rock? Or is Geothermal Energy infinite? No, it isn’t. Actually, it is as finite as Solar Energy is. One day in a far away future, earth will have cooled down completely. And the sun also will have burned all her fuel and turn into a red star. But we won’t be here anymore when that happens. It’s billions of years from now. Though there is a new theory claiming that earth’s inner cooling has sped up dramatically in recent years and that her core is therefore becoming less and less liquid. There are even movies about this fear. Wouldn’t we cool down our planet dramatically by extracting more heat from our planet?? No. Definitely not. Geothermal Energy is absolutely safe for us to use. Why? Because it is shown that human extraction of the earth’s heat has no influence on the natural cooling rate of the earth. What is Geothermal Energy’s power potential? So now that we have seen why there is Geothermal Energy at all, what can we do with it? Well, the earth’s total heat energy is 100.000.000.000.000.000.000.000.000.000.000 J (1031 J) as shown above. From this potential probably annually 500 Exajoule (500*1018J) can be harvested by Geothermal technologies. Taking into consideration that in 2008 the complete amount of energy consumed on this planet was about 474 EJ (474*1018J) it is shown that Geothermal Energy alone could solve our worldwide energy demands. And it can be used to either create heat or to create electricity. How does Geothermal Energy work better?